For some even more straight-from-the-book fun, I present to you below the official job descriptions for the various yacht steward/ess roles. These are pulled directly from The Insiders’ Guide to Becoming a Yacht Stewardess Chapter 3—a chapter that actually contains descriptions for each of the positions onboard, from Captain to Engineer, and from Executive Chef to Deckhand. And they are all presented with accompanying salary ranges. Job Function—The chief stewardess will carry out his or her duties and responsibilities under the direction and authority of the captain. As the person ultimately responsible for the interior of the vessel and for providing superior hospitality service to meet the owner’s and guests’ expectations, the chief stew will also train and manage any lower-ranking stews under his or her supervision. Excellent service, host/ess, and managerial skills are a necessity, as is having a good degree of creative flair. Qualifications—A chief stewardess should possess some type of training and experience in the areas of bartending, silver service, cigar service, and wine presentation and service. (The more extensive a stew’s wine knowledge, the better.) STCW BST certification is now mandatory for a chief-stew position, and previous yachting experience on either charter or private vessels is most always required. It is also recommended that you obtain an ENG1 Seafarer Medical Certificate, or its equivalent. Floral arranging and table decorating skills prove to be an advantage, while an Advanced/Medical First Aid Certificate or a higher degree of medical training is also a major bonus. In fact, many chief stews are now taking courses to become certified as a yacht’s Medical Person-in-Charge. This requires a seven-day course that will satisfy the standards set forth by the STCW Code A-VI/4, 4.4-4.6, offered at many of the marine training schools. While the new PYA Interior-Crew G.U.E.S.T certification is not mandatory (as of July 2013), it is wise to follow the courses outlined and seek out equivalent intermediate and/or advanced interior-crew training classes, if not sign up for the full PYA G.U.E.S.T course modules. 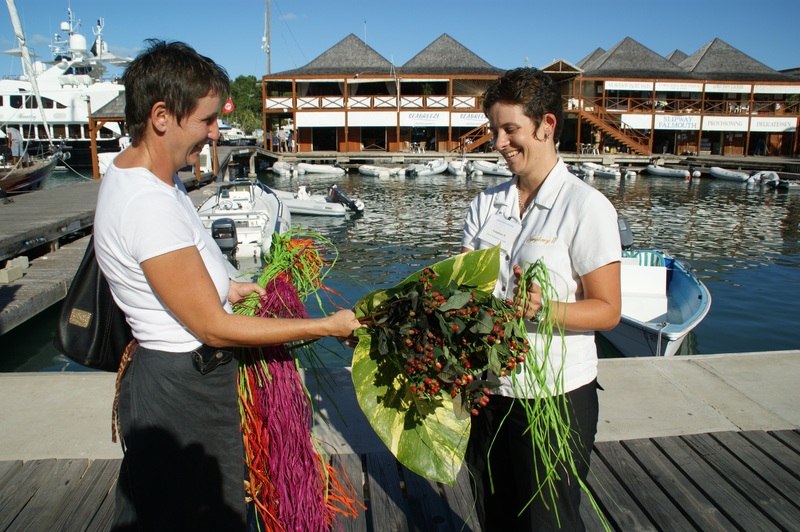 A Chief Superyacht Stewardess handles the ordering of provisions and other guest amenities for the yacht, which might include things like floral displays that the interior crew is too overwhelmed to handle on its own. While that may sound like an easy task, consider that no matter how many years a yacht stew has been doing this job, he or she will always end up in a new port (sometimes half-way around the world). First, he or she must find a reputable vendor. And not only do fresh flower arrangements need to be ordered, but they must be paid for as well. A chief stew must keep thorough accounting throughout a trip and make sure all vendors and provisioners are paid from the right accounts. Job Function—A 2nd or 3rd stew will carry out his or her duties and responsibilities under the direction and authority of the chief stew and the captain. Individuals holding these positions are responsible for assisting with the maintenance of the interior of the vessel and providing superior hospitable service, in line with the owner’s and guest’s expectations. Hostess skills should be well developed to fully accommodate the owners and their guests while onboard. Qualifications—This is an entry-level position; while previous yachting experience is not required, it does bring added salary benefits. STCW BST certification is now mandatory for obtaining even entry-level work on a megayacht. It is also recommended that you obtain an ENG1 Seafarer Medical Certificate, or its equivalent. Table service, bartending, and cocktail-service experience or equivalent qualification are crucial to landing a job—training and certification recommendations for these can be found in Chapter 7 of The Insiders’ Guide to Becoming a Yacht Stewardess. While the new PYA Interior-Crew G.U.E.S.T certification is not mandatory (as of July 2013), it is wise to follow the courses outlined and seek out equivalent introductory interior-crew training classes, if not sign up for the full PYA G.U.E.S.T introduction modules. On smaller and midsize vessels, where not as many crewmembers are needed (nor is there room for them), the core crew positions listed in the last section are often fused into what I call “dual positions.” An individual hired into such a position will assume a dual role and be expected to wear more than one “hat” during the course of a day. According to Dockwalk’s annual Crew Salary Survey in September 2013, steward/esses are making a wide variety of salaries these days, and the amount of experience and training they have makes a difference. Of course, the size of the yachts will also be a factor. Compensation for chief stews runs anywhere from $3,450 to $5,650 a month on smaller yachts (80 to 140 feet) to $5,200 to $8,000 a month on yachts over 140 feet. It is very common now to see $65K and $70K salaries, or even $90K+ on the much larger vessels. Salaries for entry-level yacht stewardesses start out between $30K–$43K a year, or $2,500–$3,600 a month. Base salaries for stewardesses, when compared with those of food and beverage servers, cabin stews, and laundry staff on cruise ships, are slightly higher. But where the potential income differences become dramatic is when you consider the tips one can earn working on luxury charter yachts, or the bonuses and perks afforded the crew on solely private yachts. Crew salary information taken from various online and agency sources and cross-checked against Dockwalk’s annual Crew Salary Survey, September 2012. While annual salary guidelines are given above, again, keep in mind that the ranges are wide because salaries will depend on a variety of factors, including the size of the yacht, the use of the yacht (private or charter), the style of boat (power or sail), and what other benefits are available to the crew, such as insurance packages or education reimbursement. Salaries may also vary depending on the specific qualifications of a crewmember, the amount of time the owner and guests use the vessel, and what itinerary will be traveled. Furthermore (and I cannot emphasize this enough), the compensation ranges listed are base salaries and do not reflect tips, if those are applicable. But here’s the kicker: no expenses. Most all positions on luxury yachts require you to live aboard and travel with the vessel, and therefore, your room and board are completely covered. It is customary and expected that everything you need on a daily basis is provided by the yacht owner—your meals, your uniforms, laundry detergent, linens, and on most boats, even your personal hygiene products, such as soap and toothpaste. Meanwhile, your earnings automatically go into your bank account. What other job can you take where, at the end of the year, you have nearly your entire salary sitting in your bank account, relatively untouched? Most people in other industries are lucky if they save 1/10 of the amount they earn in a year. Why? Because they are paying rent and utilities, buying and maintaining cars, and purchasing all the clothes they wear to work each day. And let’s not forget groceries. Ready to find out how to get started one your way to working on a yacht? All the advice you need to land that first yacht job can be found in this guide. Good luck! Photo Source: Suki Finnerty of YachtingToday.TV. Interested in more advice on how to become a yacht stewardess and what it takes to handle the job? Download Chapter 1 of The Insiders’ Guide to Becoming a Yacht Stewardess 2nd Edition here. This is something I really would like to do !! I’m going to check into getting the training ! !